Our love of orchids has been tempered with an ethical imperative about conservation and preservation of habitats that was absent back in the time of the exploitative, predatory Victorians. Throughout, this prodigious show highlights the extent of the Victorians’ often piratical obsession, not only through its exquisite, floral pageantry but by showcasing the historical artifacts, books, pictures, narratives that adorn the pathways where the lusciously fragrant Oncidium Rosy Sunset ‘F’ orchids dance (they smell like chocolate), and the Oncidopsis Memoria Martin Orenstein ‘Lulu’ (pansy orchids) charm with their smiling faces that bloom with scintillating color. The narrative discloses “movers and shakers like Benedikt Roezl, the “Prince of Orchid Hunters,” who was the most famous and successful orchid collector of the era. Through the doors of this first gallery, one saunters slowly to view the sights and smell the sweet fragrances of varieties of Oncidium (dancing ladies orchids), and experience the wonder of orchids like Bratonia Kauai’s Choice with its austere shape and long, hanging petals. Around each turn is the unusual, like the vanilla orchid whose pods are not beans and which is the only orchid of natural economic value from which we derive all our vanilla flavoring. Along the pathway you will encounter the desert orchid Eulophia Petersii and a display case filled with orchid miniatures and valuable, rare orchids from the NYBG’s permanent collection. Within the case is a yellow orchid that has the fragrance of horse manure, a scent irresistible to its fly pollinators. Is it any wonder that Charles Darwin, Victorian contemporary and “fantastic observational botanist” (quote from Marc Hachadourian NYBG orchid curator), who was all too familiar with the rapacious frenzy of orchid collectors and the lurid stories of explorers’ dire misfortunes in jungles, high plains, mountains, and plateaus, that the notion of predatory survival in nature spoke to his heart and perhaps added weight to his evolutionary theories? There is a nod to Darwin as an aficionado of orchids with a marvelous explanation and illustrations of an ingenious discovery Darwin intuited about the Darwin Star Orchid and its pollinator that you can see on your way through the galleries. On the final expeditionary leg one reaches the centerpiece of the exhibition, and the apotheosis of Victorian orchid frenzy, a 360 degree supernal, floral prominence rising over 8 feet tall in glittering, vivid technicolor. This otherwordly mountain is awash with orchids of varying species, Phalaenopsis, Oncidopsis, Oncostele, Oncidium, Vandas, Paphiopedilum (lady slippers). The hundreds of orchids vibrate a multitude of colors-fuscias, yellows, variegated pinks, roses, tricolors, whites, pale yellows, maroons, and more. Victorian Orchidelirium gave birth to the billion dollar orchid industry that abides today. 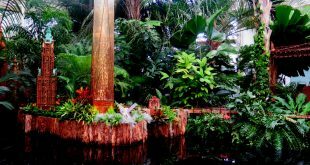 It even gave rise to the New York Botanical Garden’s ornate Victorian Enid A. Haupt Conservatory and its missions of research, preservation and protection of orchid species and hundreds of other plants that are becoming extinct because of illegal poaching, habitat destruction and climate change. With every delicate bloom, every fern, every pitcher plant, “Orchidelirium” is a bedazzling, live horticultural spectacular, a sterling exhibition to celebrate the NYBG’s 125th Anniversary.